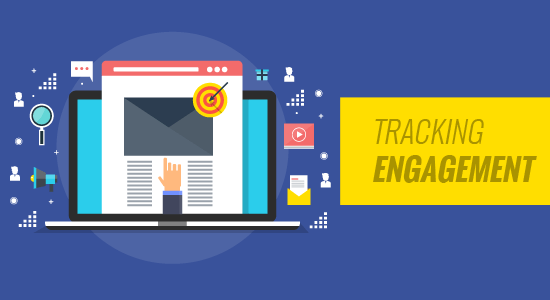 Are you properly tracking user engagement on your WordPress site? User engagement is one of the most important metric to track because it helps you strategically plan for growth. In this article, we will show you how to track user engagement in WordPress with Google Analytics. Generally, website owners consider traffic and pageviews as the most important indicators of their website’s performance. They assume that higher traffic will result into more conversions and sales. While that is true, you can get even better results by tracking and optimizing user engagement. User engagement shows you what users do when they arrive on your website. It helps you identify patterns of highly engaged user behavior which leads to more conversions and sales. For example, you may realize that users visiting a specific page are 10X more likely to make a purchase vs any other visitor on your website. You can use this insight to redirect more user’s attention to that page. 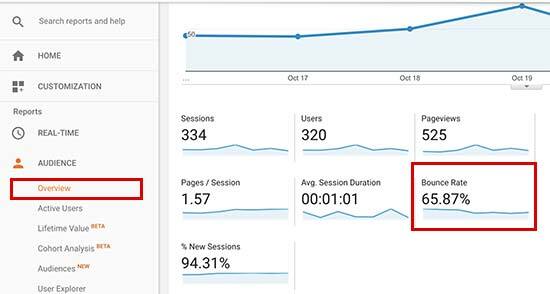 To track user engagement on our websites, we use Google Analytics in combination with the popular MonsterInsights plugin. If you haven’t already signed up for Google Analytics, then you can follow the instructions in our guide on how to install Google Analytics in WordPress. 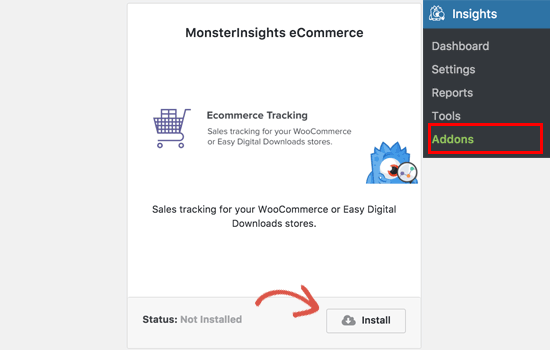 Next, you need to install and activate the MonsterInsights plugin. We recommend getting the Pro plan of this plugin. Now most people ask us why install a plugin, when you can just paste the Google Analytics script in the footer of the website. The reason is that by simply pasting a link in the footer, you miss out on key user engagement data. You won’t know which outbound links are users clicking, which forms have the highest conversions, which products in your online store has the best conversions, which affiliate links or ads are getting the most clicks, etc. MonsterInsights plugin automatically handles all of that and more for you. It automates the process of pasting different analytics code and event tracking scripts in the footer, so you don’t have to deal with the hassle of code and configuration. 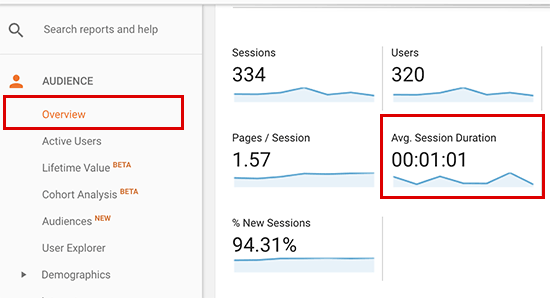 Once you have setup Google Analytics with MonsterInsights, let’s take a look at how to track different user engagement metrics for your site. The first thing you want to figure out is which blog posts and pages are the most popular amongst your users? These are the pages and posts on your website getting the most traffic. Figuring out what your users like on your site can help you plan a content strategy that expands on what’s already working. MonsterInsights makes it really simple. You just need to visit Insights » Reports page in your WordPress admin area. You will find your most popular content under the ‘Top posts and pages’ section. Next to it, you’ll also see your top traffic sources. This gives you a general idea of where your traffic is coming from. On most websites, 90% of their traffic goes to 10% of the top pages. Once you find these top pages, you can optimize them for maximum conversions by adding content upgrades or targeted lead magnets on these posts. We find that by adding content upgrades can help you boost your conversions by as high as 845%. Our founder Syed Balkhi has a blog post sharing the case study results. Most websites rely on contact forms to collect user leads and feedback. Sadly most contact form plugins don’t give you accurate tracking and conversions data. 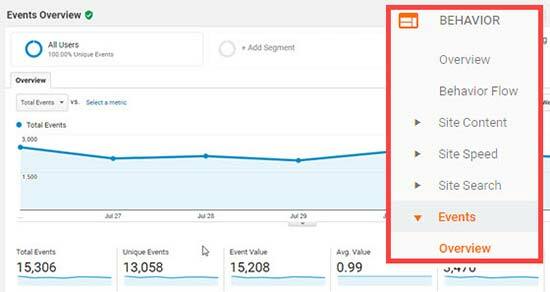 MonsterInsights lets you leverage Google Analytics’ events tracking feature to see how many times your forms are viewed and submitted. To enable forms tracking, you need to visit Insights » Addons page. On this page, you will need to install and activate the Forms addon. 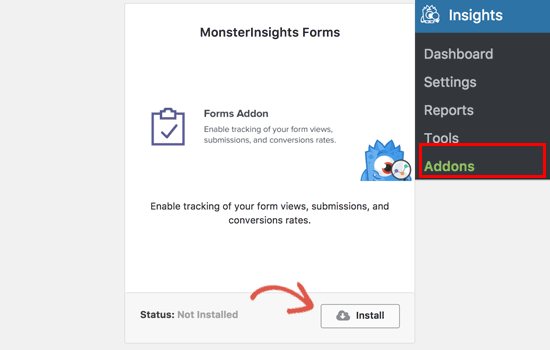 Once you have activated the Forms addon, MonsterInsights will automatically start tracking all forms on your website. It automatically works with popular contact form plugins like WPForms, Ninja Forms, Formidable, and others. MonsterInsights also track your website comment form, user registration forms, and more. To see how your forms are doing, you will need to visit your Google Analytics account. 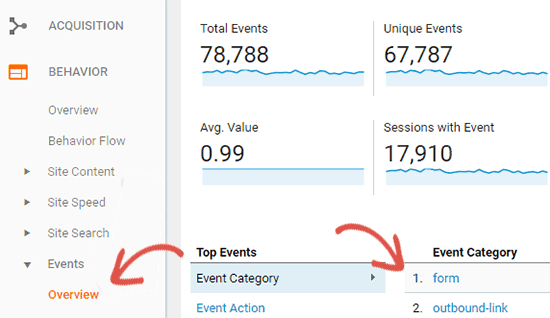 In the Google Analytics dashboard, click on Behavior » Events » Overview page and then under ‘Event Category’ click on ‘form’. 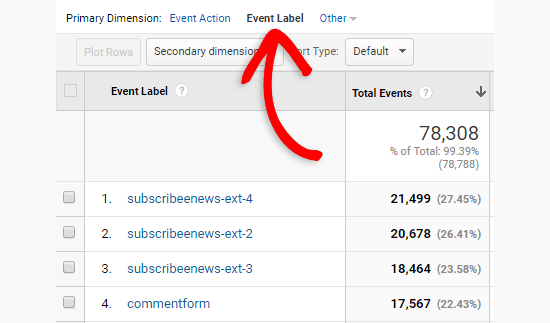 Next, you need to click on the ‘Event Label’ to see stats for different forms on your website. From there, you can click on any form to see your impressions and conversions. Google Analytics offer many features specifically for eCommerce websites. However these features are not turned on by default, and most users don’t even know that they exist. Enhanced Ecommerce tracking lets you see shopping behavior, checkout behavior, product lists performance, sales performance, and so much more. The best part is that you can combine this data with your overall website traffic to gather better insights. 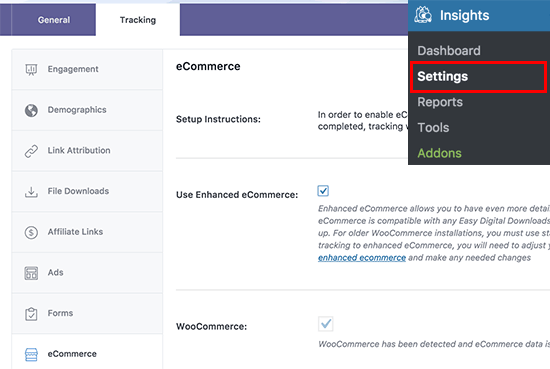 MonsterInsights eCommerce tracking for WordPress works with both WooCommerce and Easy Digital Downloads. 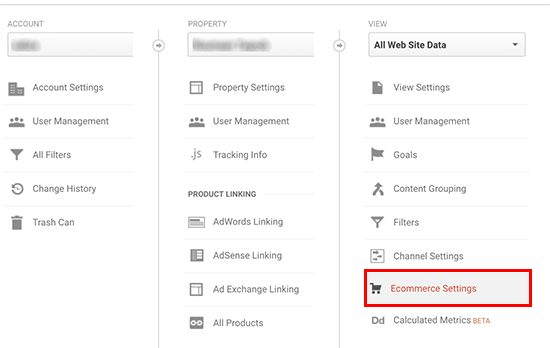 First, you will need to enable eCommerce tracking in Google Analytics. Head over to your Google Analytics account and switch to the admin page. Next, you need to click on the ‘Ecommerce Settings’. Now click the slider under the first step, Enable Ecommerce, to turn it on. You need to click on the Next Step button to continue. We also recommend that you turn on the Enhanced Ecommerce settings. Once you are done, click on the submit button to store your settings. Next, you need to switch to your WordPress admin area. Go to Insights » Addons page and install and activate the ‘Ecommerce Addon’. 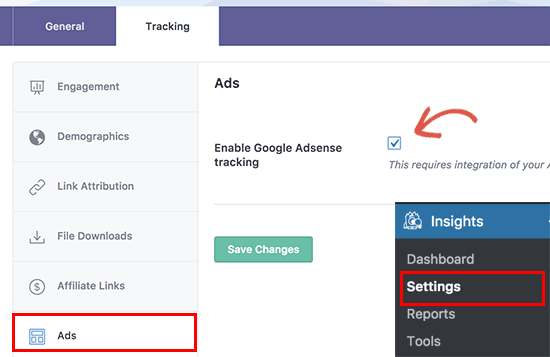 After that you can head over to Insights » Settings page and click on the tracking tab. Next, click on the Ecommerce section to continue. On this tab, you need to check the box next to ‘Use Enhanced eCommerce’ and then click on ‘Save changes’ button to store your settings. 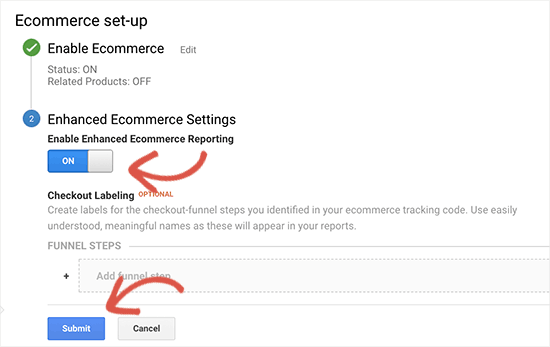 To view your ecommerce tracking reports, you need to visit your Google Analytics account and go to Conversions » Ecommerce page. 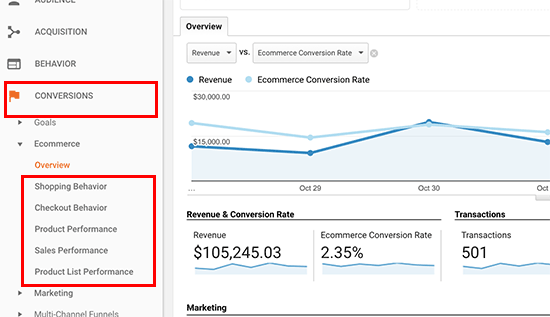 For more details on each of these reports, see this article on adding Google Analytics enhanced ecommerce to your website. Many websites rely on ads to make money online while creating useful content. Advertising platforms like Google AdSense provide you some reports on ad impressions and clicks. First you will need to visit Insights » Addons page on your WordPress site. Now install and activate the ‘Ads Tracking’ addon. 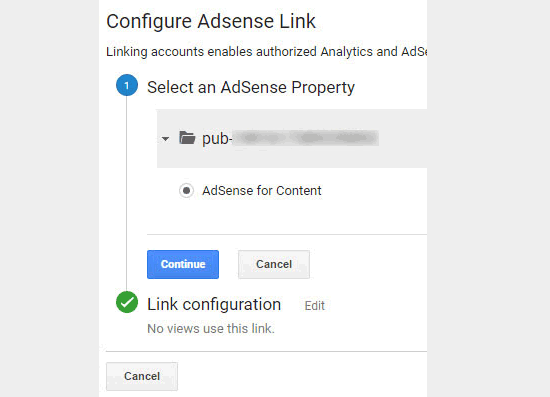 Next, you need to integrate Google Analytics to your Google Adsense account. Head over to your Google Analytics dashboard and click on the ‘Admin’ button located at the bottom left corner of the screen. 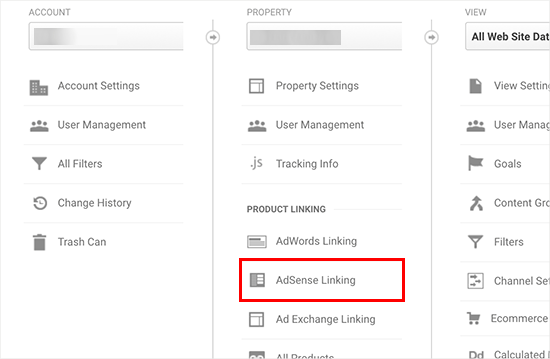 On the admin page, click on ‘AdSense linking’ under the property column. 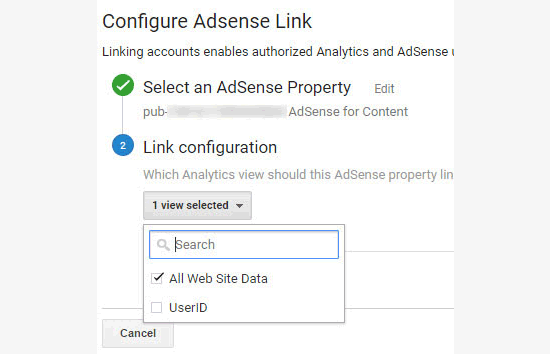 Next, you need to click the +New AdSense Link button and then select AdSense property that you want to link with your Analytics property. After that, click on the continue button to move forward. Next, you need to select the Analytics view in which you want your AdSense data to be available. Once you select that click Enable Link and then click Done. 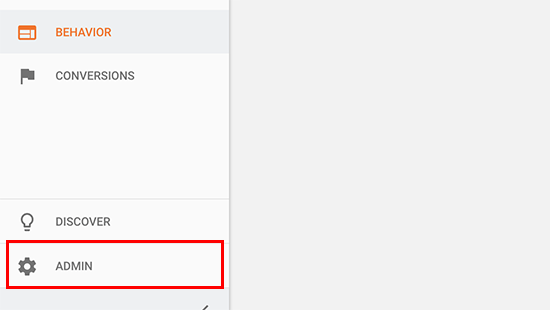 After you have configured everything in Google Analytics, you need to head over to your WordPress site and go to Insights » Settings page. Switch to the ‘Tracking’ tab and then click on the Ads section. 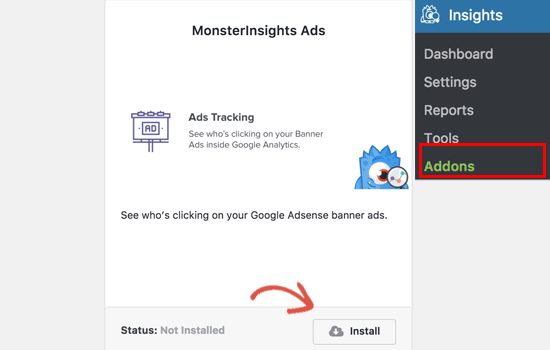 You need to Enable Google Adsense tracking in MonsterInsights. To view your AdSense performance reports, go to your Google Analytics account and visit Behavior » Publisher page. The overview report gives you a high-level summary of key AdSense metrics. You can also find the Publisher Pages and Publisher Referrers report in Google Analytics. MonsterInsights allows you to track those affiliate links in Google Analytics. This helps you figure out which affiliate products are doing well, which pages are generating more affiliate revenue, and more. 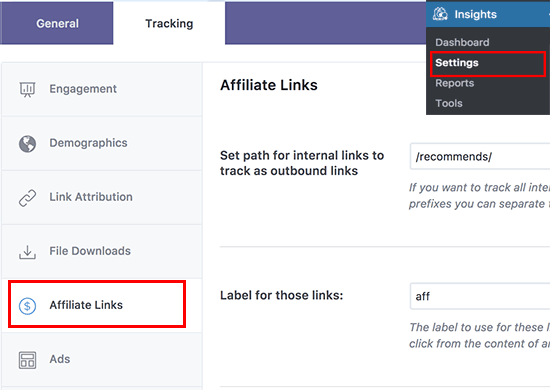 To enable Affiliate link tracking, you need to visit Insights » Settings page. Switch to the tracking tab and then click on ‘Affiliate links’ section. First you need to enter the slug you use for your affiliate links. After that, you need to provide a label you would like to use for those links in your Google Analytics reports. Next, click on the save changes button to store your settings. 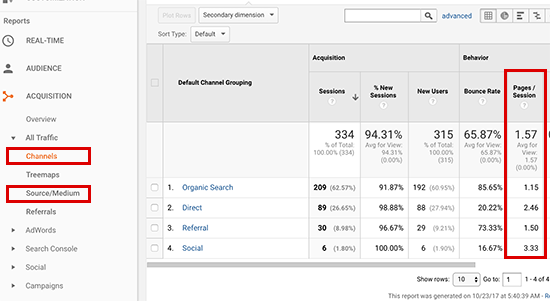 MonsterInsights lets you track affiliate clicks as events in Google Analytics. 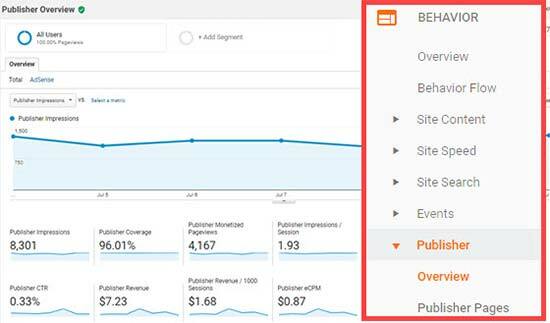 To find an overview of your affiliate link clicks report, you can go to Behavior » Events » Overview page. Your affiliate link clicks will be shown with the label you chose earlier. For more detailed instructions, see our guide on how to track outbound links in WordPress. Note: most WordPress affiliate plugins may promise to give you link stats. We have found most of those stats to be highly inaccurate because most WordPress based analytics tracking breaks due to caching. Google Analytics is the only way to properly track analytics. 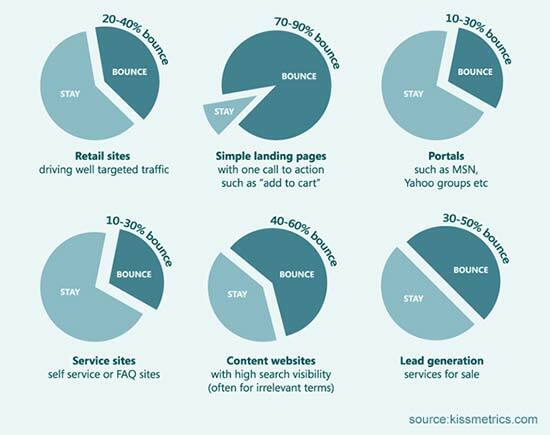 Bounce rate is the percentage of users who land on your website and decide to leave without going to a second page. To check your website’s bounce rate, you need to login to your Google Analytics dashboard and then go to Audience » Overview page. Want to see an individual page’s bounce rate? Head over to Behavior » Site Content » All Pages to see all pages from your website. You can sort the pages by higher or lower bounce rate to see which pages are not performing. Higher bounce rate indicates that you were unable to convince the user to visit other pages. Users can leave your website by clicking on the back button in their browser, clicking on an outgoing link, or by closing the window. Bounce rates are completely normal. However higher bounce rates indicate problems with your website affecting user experience and causing low conversions / engagement. What should be the acceptable bounce rate for your website? Here is a general breakdown of bounce rate from good to bad. An excellent bounce rate is between 30% and 50%. However, most websites fall between 50% and 70% bounce rate which is an acceptable average. Bounce rates higher than 70% are considered poor for most websites. Not all websites are the same which means average bounce rate vary depending on different kind of websites. For more on this topic, see this article with tips to reduce bounce rate on your website. Another indicator that shows user engagement is session duration or time users spend on your site. If users are abandoning your site without spending enough time to look at it, then something is wrong that needs to be fixed. 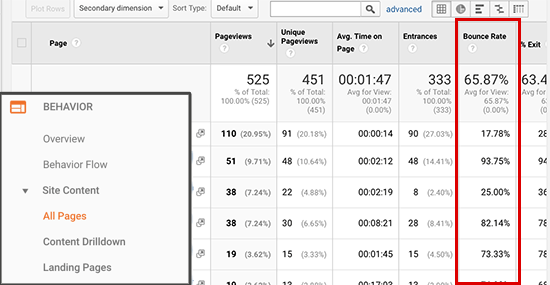 Google Analytics can show you the average time users spend on your site per session. Simply go to Audience » Overview page, and you will see it among other stats. It can also show you how much time users spend when viewing individual pages. You can check it by visiting Behavior » Site Content » All Pages page in Google Analytics. To learn how to improve session durations, take a look at this article with practical tips to increase time users spend on your website. Page views per visit is another great indicator of how engaged your users are. 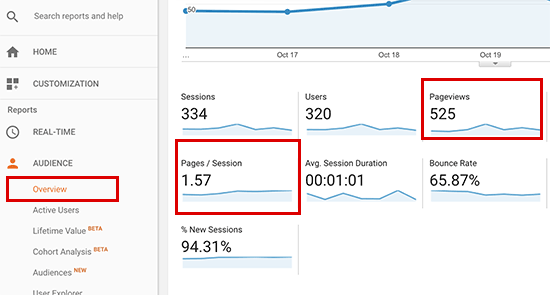 More page views per session also increases time users spend on your site and decreases bounce rates. 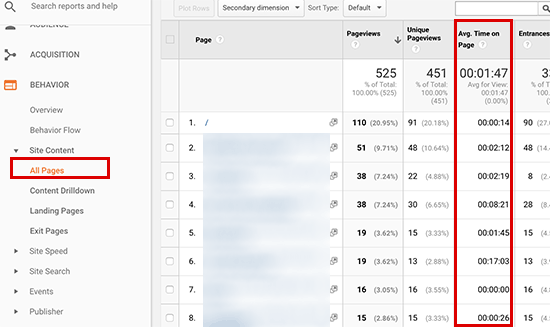 Google Analytics will show you the total page views for a given period on Audience » Overview page. However, to track user engagement you also want to see page views per session. You can also break down page views per session by source and channel by visiting Acquisation » All Traffic » Channels page. This helps you see which traffic channels are converting the best for your website, so you can focus your efforts on areas that are actually driving results. 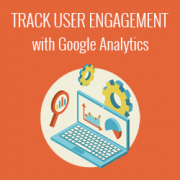 We hope this article helped you track user engagement in WordPress with Google Analytics. You may also want to see our ultimate step by step WordPress SEO guide and email marketing 101 guide for beginners. Great post. You’ve convinced me to go pro for monster insights I didn’t realise analytics had those ecommerce functions!! Thank you, very useful article. Integrating through .php was a little different, but Google helps out!